Funding The Immigration Crackdown At An 'Unsustainable Rate' The deportation and detention of immigrants in the wake of the Trump administration's immigration crackdown is costing the government millions, and forcing reallocations of funds. 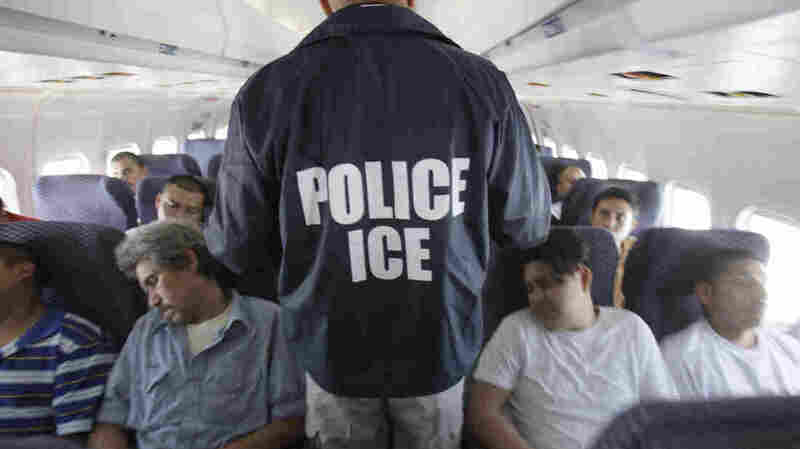 An Immigration and Customs Enforcement agent walks down the aisle among shackled Mexican immigrants on board a U.S. Immigration and Customs Enforcement charter jet for deportation. President Trump's immigration crackdown has not come cheap. Take the cost of deportation: Immigration and Customs Enforcement has its own airline operation to fly deportees back home. So far this fiscal year, it's $107 million over budget. ICE Air is the little-known, one-way ticket transportation arm of Immigration and Customs Enforcement. ICE Air is busier than ever because of stepped up deportations under President Trump, and more countries around the globe agreeing to take back deportees from the U.S. The cost to keep up the pace has jumped 30 percent this fiscal year. Ten times a week, an unmarked white jetliner lands at the airport in Guatemala City and disgorges a hundred or so unhappy passengers. They enter the Guatemalan Air Force terminal, check in with immigration, and spill out of double-doors, ready to sneak back to the U.S. border, or restart their lives at home. 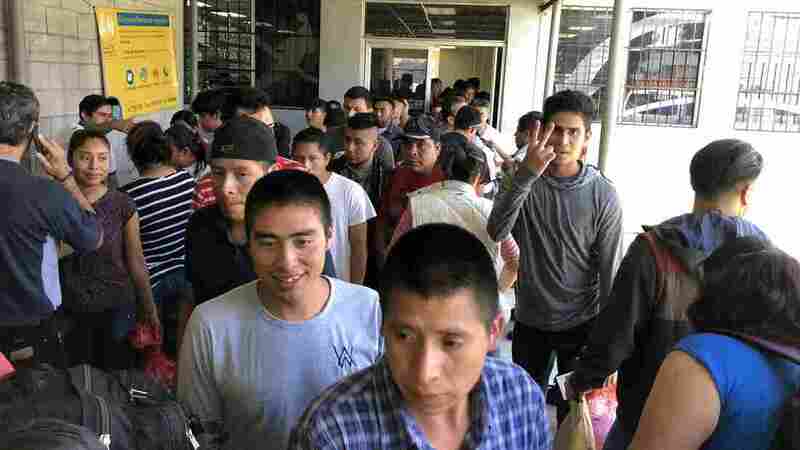 Guatemalan deportees at the airport in Guatemala City, after being flown back by Immigration and Customs Enforcement. ICE Air is $107 million over budget so far this fiscal year. "I left Guatemala in 1983," explained 53-year-old Luis Alberto Castro. He overstayed a student visa 35 years ago, started a remodeling business in Salt Lake City, raised a family, then got arrested and deported. He carries a plastic bag full of belongings. His sneakers are loose because they took away his shoestrings during detention. "I am sad," he said. "But what are you gonna do? I'll see my family. My wife is willing to come here." Castro says he was picked up by immigration agents after he was pulled over by the cops for speeding. He complains ICE Air treated everyone onboard like a felon. "We were handcuffed the whole time," he said. "They shouldn't be treating us like total criminals." An ICE spokesman says restraining unlawful immigrants is consistent with their detention standards. On the flight from Mesa, Ariz., to Guatemala City, there were no in-flight movies. No pillows. No pretzels. Castro says a dozen uniformed security guards kept an eye on them. Lunch was a sandwich. American cheese — their farewell meal. The guards came around with handcuff keys as the airliner descended toward the conical volcanoes that surround the Valley of Guatemala. ICE Air flew more than 97,000 migrants home last year. Most went to Guatemala, followed, in order, by Honduras, El Salvador, Haiti, the Dominican Republic, Brazil, Ecuador, and Colombia. ICE Air also flies detainees between U.S. cities, as jail populations ebb and flow. For deportations of "high risk" immigrants, ICE charters smaller Gulfstream jets. When there are not enough deportees to fill a charter flight, ICE buys tickets on commercial flights. This summer, however, several major carriers refused to fly children who'd been separated from their parents by the government. ICE Air relies on a network of contractors. The biggest was CSI Aviation of Albuquerque, New Mexico — whose contract with Homeland Security swelled from $88 to $96 million this year. In July, CSI says the ICE Air contract was awarded to a different company. It's not just ICE's airline operation that's over budget. The Trump administration's immigration crackdown is straining resources across the federal government, leaving officials scrambling to cover the additional cost of detaining and deporting more immigrants. The budget for Department of Homeland Security, which includes Immigration and Customs Enforcement, is upwards of $47 billion. ICE's budget for custody operations is a record $3 billion dollars this year — up from $1.77 billion in 2010. So Homeland Security and other agencies are moving money around to fill the gaps. Last month, the DHS informed Congress that it's reallocated about $200 million from its current budget away from the Coast Guard and FEMA, among other things, to cover ICE operations. It's not unusual for administrations to reallocate resources. The Obama administration did the same thing when a surge of unaccompanied children from Central America arrived at the southwest border in 2014. Prevented by law from turning them back, the administration faced the unexpected expense of caring for these children. Now the Department of Health and Human Services is caring for a record number of unaccompanied children in government-funded shelters. HHS moved $260 million from other parts of its budget to cover the expense, including funds that were appropriated for the Centers for Disease Control and Prevention and the National Cancer Institute. Lawmakers on both sides of the aisle have objected to these reallocations. Democrats complain that the administration's priorities are out of line. While some Republicans have criticized a "lack of fiscal discipline" at Immigration and Customs Enforcement. ICE is spending "at an unsustainable rate," according to a report issued in June by the Senate subcommittee for Homeland Security, which is chaired by Republican Senator Shelley Moore Capito of West Virginia. In a statement, DHS says the reallocation is necessary to support its current staffing levels and operations. Meanwhile the Trump administration has even more ambitious plans. It's still seeking funding for a wall on the southwest border. The administration also wants to detain more migrant families apprehended at the border, and for longer. Immigration authorities are currently allowed to hold children and families in immigration detention for a limited time; the administration is seeking to detain them indefinitely. To detain thousands of migrants arriving at the border every month, the administration would need to build and operate more family detention centers. And experts say that would likely require hundreds of millions of dollars in new money from Congress, not just the reallocation of existing funds.